Have you ever wanted to change your life? Make it easier or, at least, get rid of the tough stuff? Have you ever simply asked yourself, ìWhat if?î Anyone who wants a void filled, a problem solved, or a question answered, can learn to innovate. And it doesnít matter how much education you have or how high you sit on the corporate ladder. If you think that learning innovation means reading boring instructional manuals and paying a fortune for classes, youíre wrong. Innovation for Underdogs explains how innovation is a practical process, not some miraculous insight. Everyone can innovate! truths about innovation through his experiences with othersóhis childhood lessons from Einstein, his work as a university professor, and his highly esteemed innovation lectures throughout the world. 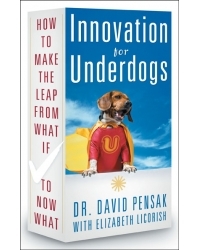 Innovation for Underdogs shows the underdog (that would be you) how to dig to the root of your greatest problems and surface with solutions to make life a lot easier (and more lucrative!). Using entertaining, energetic, and enlightening stories from Dr. Pensakís experience, This book makes it clear that the underdog is bred for creativity. Within these pages, you will learn how to clearly define and solve a problem and how to market the solution. Filled to the brim with advice, examples, and exclusive interviews, Innovation for Underdogs is the creative personís best friend. Dr. Pensak also founded Raptor Systems, the computer security company that developed and brought to market the first commercially successful Internet firewall. He has 38 patents and applications being prepared in fields ranging from agricultural chemistry to solid state physics and business-process modeling. Dr. Pensak is highly esteemed both domestically and internationally. He has taught at the worldís most prestigious universities and lectured at its most powerful corporations. Currently speaking globally and launching his International Innovation Center, Dr. Pensak has teamed up with coauthor Elizabeth Licorish to write this book.